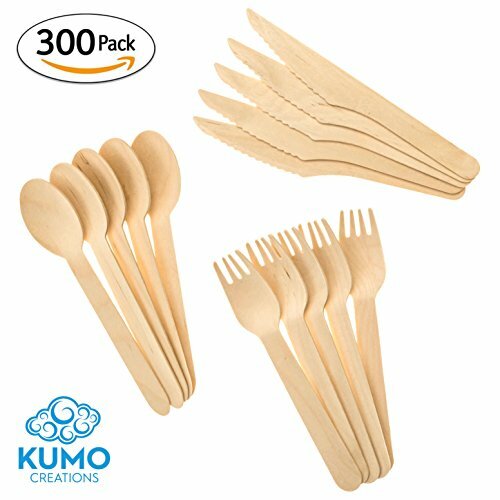 Wooden Disposable Cutlery Combo Set – 300 pc - 100 Forks, 100 Spoons, 100 Knives, 6” Utensils - Eco Friendly, Biodegradable, Compostable – Parties, Weddings, Gatherings – FORGET Plastic, GO GREEN! Want to make a change and save the environment? Let's start with dropping plastic cutlery and make the switch to wooden cutlery. Click ADD TO CART now, and let's start making that change. It starts with you! ► WHEN WOULD YOU USE THIS? Kumo Creation's Wooden Disposable Cutlery is great for any occasion. They can be used for parties, picnics, weddings, arts & crafts, desserts, special get-togethers with family and friends, and still many more occasions. The usefulness is only limited to the imagination! Our disposable utensil set totals to 300 dinnerware pieces - 100 forks, 100 spoons, and 100 knives. Each piece is intended to be used once, and then tossed away stress free. Perfectly Sized Forks & Spoons measure to 6.25" and Knives measure to 6.5"
Plastic and the Environment: Harmful chemicals and toxins are released into the environment during the incineration process which pollutes the air, land, and water. Synthetic plastic does not biodegrade and sits in landfills only to pollute our environment. Plastic and People: Plastic have been documented in health risks for a number of years. Chemicals such as BPA have been known to exist in plastic and can be absorbed into the body thru food. Plastic with simply BPA has been linked to ailments including asthma, cancer, infertility, low sperm count, genital deformity, heart disease, and ADHD. Click Add to Cart now and let's save the environment together! ✔️PREMIUM QUALITY DISPOSABLE WOODEN CUTLERY SET - Top quality utensils and FDA Approved, makes a perfect item for picnics, weddings, parties, or any kind of event to share with loved ones or best friends. ✔️FORGET PLASTIC AND SAVE THE ENVIRONMENT! - Made of 100% FSC Certified Natural Biodegradable Smooth Birchwood. Utensils are eco-friendly and naturally breaks down into the environment, made of non-toxic and compostable wood. Truly a great alternative to plastic cutlery! ✔️FUNCTIONAL, DURABLE, AND PERFECTLY SIZED - All Utensils measure to 6.25" in length and each are similar to plastic utensils or traditional silverware for dining or catering. Our FDA Approved Utensils can be used to eat a variety of foods including meats, salads, fruits, desserts and many more. ✔️HEALTHY! UNLIKE PLASTIC, NO BPAs HERE! - All Utensils are non-toxic, safe and chemical free; and does not leak harmful chemicals into food or the environment. FDA and FSC certified! Made of good ol' fashion birchwood! ✔️SATISFACTION GUARANTEED - We have a Money Back Guarantee for all purchases, and if you are not satisfied with your purchase, simply return for an exchange or refund. Our goal is to inspire and make a change to the environment! If you have any questions about this product by KUMO Creations, contact us by completing and submitting the form below. If you are looking for a specif part number, please include it with your message.